Good morning darlings! A few days ago I was staring at my dresser shaking my head. I try and keep my things in order and neat but I just have entirely way to much jewelry (not that I'll ever admit that to my husband LOL). It all serves its purpose each piece fits for an occasion or season so it does eventually get used. However, wearing a different necklace every day results in pretty much my dresser looking like a chaos of jewelry that I have to sort through to find the piece I'm looking for for the day. So last night my stand arrived and of course I HAD to get it all set up and figured this be perfect to blog about. 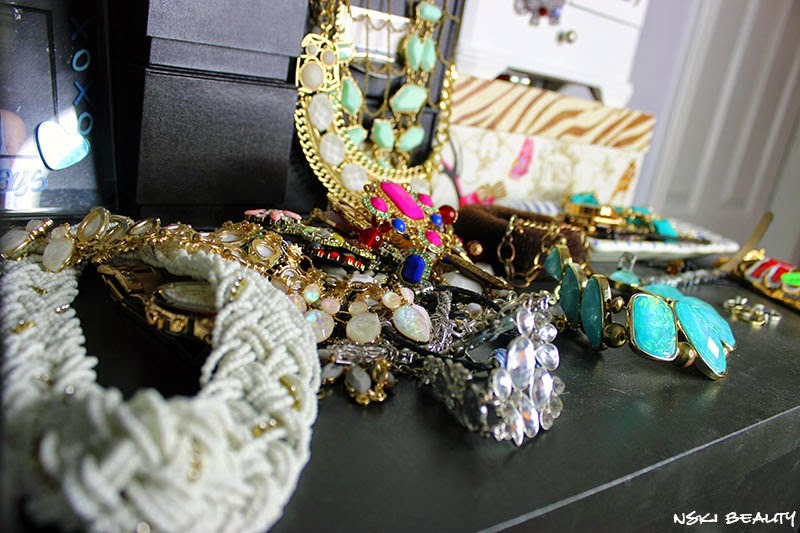 Cause lets be honest, I'm not the only jewelry addict with their dresser looking like an explosion hit it. JEWELRY CHAOS! SUCH A MESS. Now here's the happily organized (freshly dusted too!) and easily visible necklaces & bracelets. I'm sure I'll tweak it here and there as I see fit but for now I'm so much happier that I can see all my necklaces and put my every day bracelets & rings without leaving a huge mess in my wake. All my necklaces now hang preventing any tangles and are all easy to distinguish between so I know exactly what to reach for in the morning. My watches, bracelets (that I wear daily) and my engagement ring & wedding band (I take them off at night unless we leave the house then they go back on = ]) all have a home that is both neat and chic. This is by far one of my favorite pieces on my dresser. It was a gift from my God Mother / Aunt & Uncle that they saw on of of their trips before our wedding. 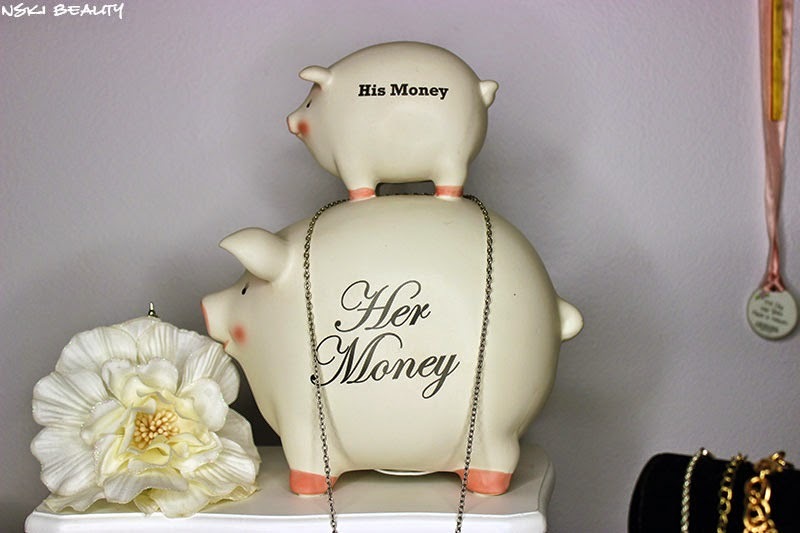 You put the coins in the top of "His Money" and theirs a hole in his belly that drops the coins into "Her Money" part of the piggy bank. I seriously laughed for a good twenty minutes after opening it and Gregory glanced over shrugged and said "Pretty much" which made it all the funnier! 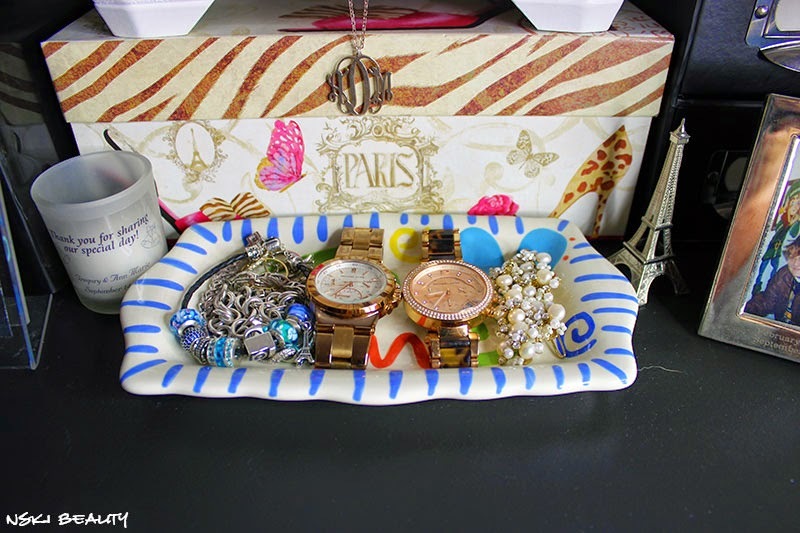 What do you do to keep your jewelry organized? Do you have a designated set up? Labels: DIY, Groop Dealz, It's A Bling Thing, Jewlery, Just Blogging, Lucky, Michael Kors, Organize, Tiffany & Co. This is so smart! I seriously need to clean my jewelry up but I keep avoiding it because it's such a mess. I love that little dish for your rings--super cute! That's great, it still looks very defined, but also tidy and organized. I have a jewelry box but I've been slowly giving my jewelry away to my nieces and goddaughters as birthday presents. I really don't wear it any more - it's not like I need to sparkle in the goat pen, ya know? I've kept a few pieces so I won't disgrace myself on the few occasions I do go out. First of all love the piggy banks. Adorable. And that looks like all my jewelry. I have so much from working at a jewelry company. Storage is very important. Oh, I love this organization!! I NEED to organize my stuff! I love the piggy bank!! I love that! I definitely need to work on mine. Wow, you have so many wonderful pieces! I use a hanging jewelry boxes that I can put photos in on the front. I love it. I have been wanting to get one of these jewelry stands for necklaces and bracelets so thanks for guiding me on where to find one! That piggy bank is TOO cute! I really need to get some organization in my life. 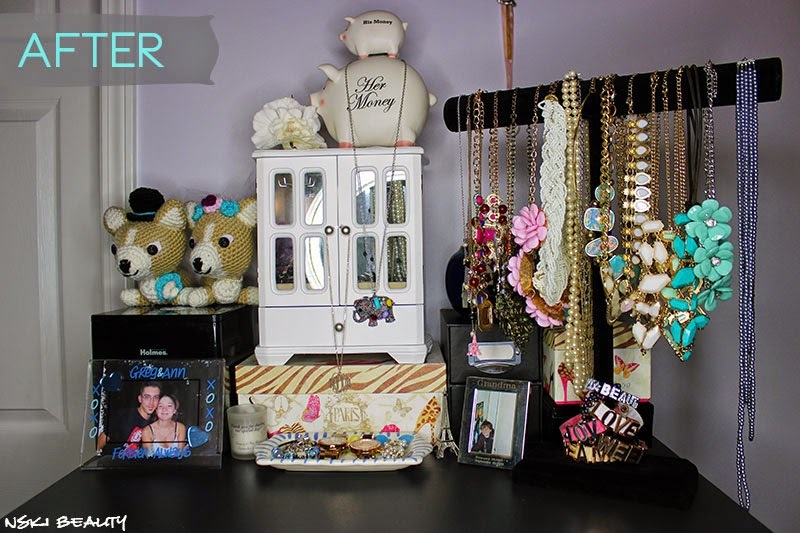 Organizing all the things on my large surfaces is so hard, especially when it comes to both jewelry and makeup. I love what you did, and I may need to invest in one of those necklace holders. And I am absolutely IN LOVE with that piggy bank! OMG! I really should have my jewelry organized. It all just kind of sets on my counter! It looks so good! 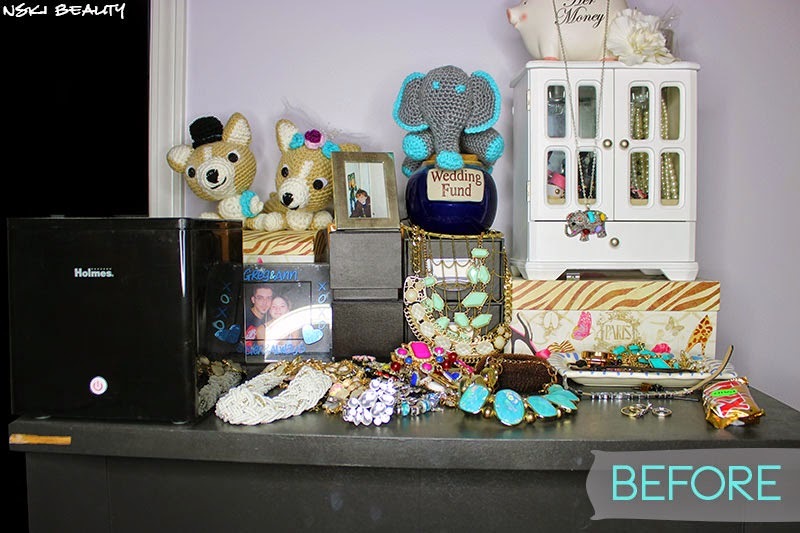 I am working on organizing my jewelry! Its a slow process! 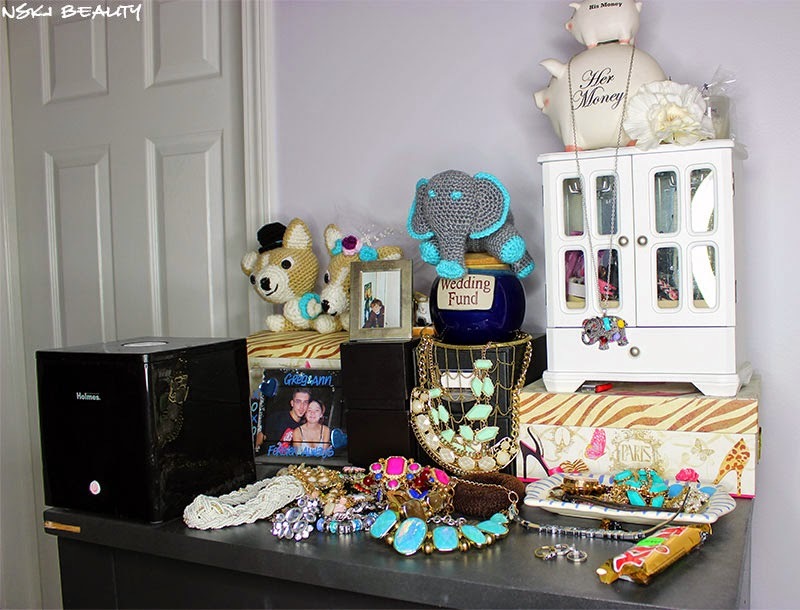 I have a pretty compartmentalized box from Anthro I use for my earrings, a necklace stand for my bracelets, a tiny silver elephant holder for my rings, and I hang my necklaces from hooks on the wall! It looks so good! 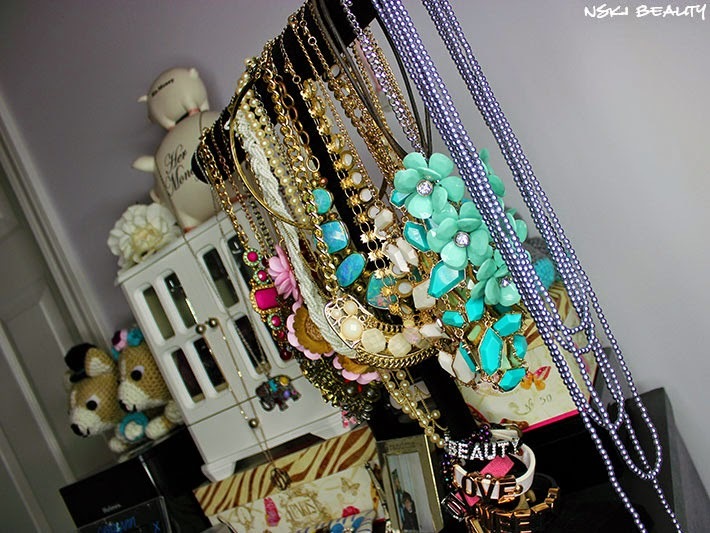 I love the idea of hanging necklaces to display them!